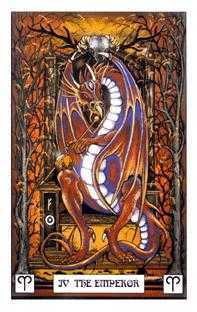 Fantastical artist Peter Pracownik illustrated the mystical Dragon Tarot deck with colorful beasts inspired by legends in dragon mythology from many different cultures over many centuries. 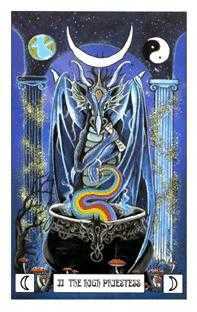 Dragons are an ancient symbol of knowledge and power that appear in the history of virtually every culture in the world. In looking at the legends of Dragons from so many divergent cultures and traditions, we can see that they are in fact linked together. 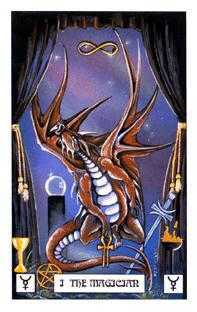 This Tarot is based on the Dragon symbol because each Dragon is a different finger pointing to the same Moon. We have pulled together all of the legends of Dragons from around the world, from China to South America, and honored each of them. We have given the keys through which many of the mystical secrets of Life may be realized. We have approached the symbol of the Dragon not as an adversary to humankind, but rather as a challenge for us to discover our own boundaries, and think about going beyond them. 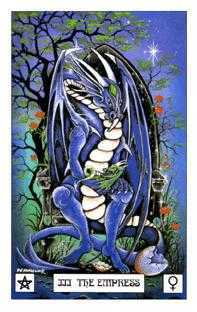 I’ve specially written Dragonland–A Traveler’s Report to open up the realm of adventure found in the fantastic world of myth and magic inhabited by the Dragon. In the outline of Dragonland, you will enter a world which, as it was experienced, we could almost see and feel with our physical senses. Perhaps somewhere in the mists of time it describes a place not too different from where we as a race of beings do come from. Dragonland may be experienced on many levels. As a flight of fantasy, a world where we may find relief from the pressures of our everyday lives. Experience it as a journey, a symbolical rite of passage; as a set of keys, a meditation on the mysteries of life. 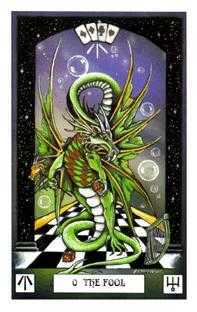 You will experience this Tarot on different levels at different points in your development. Therefore, some of what you see now in any one card you may not find there further down the line. Conversely, some of what isn’t there just at the moment may become more manifest as time goes on. In the section entitled Your Journey, we are opening up the chance for you to go on an adventure. We are showing you the techniques by which you can begin to gain access into that same fantastic world of imagination, whether you want to think of it as existing in your imagination, or inside your own soul. 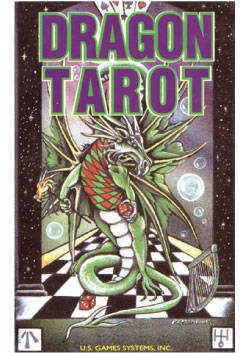 In Mastering the Tarot, we show you ways in which you can actually put the cards together to use in readings. 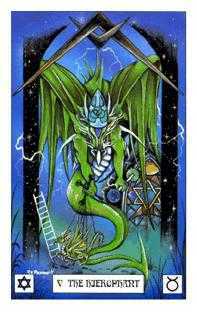 Fifty percent of the beauty of working with the Tarot is to be realized through your own personal meditations on the symbols; the other fifty percent is achieved through using the cards in readings for others.